It's a celebration, and you're invited! One silver and two gold. That's what the Young People's Chorus is bringing home to Erie tonight at 6 p.m. at the Penn State Erie campus, and the community is invited to welcome the troupe back and celebrate its accomplishments in the parking lot in front of Erie Hall. The Young People's Chorus left Erie Tuesday, July 3 to compete in the World Choir Games, held in Cincinnati, Ohio, marking the first time the games were held in the United States. Because of its success in Cincinnati, the choir qualified for the champions' competition in Latvia, where the 2014 WCG will be held. "If you've never seen or heard YPC, you are missing a unique experience. The choristers walk on stage as young people—children, really—but when they start to sing, goosebumps appear on your arms," said Alyson Amendola, executive director. "They sing with such confidence and command—they are that sensational. The young men and women worked hard just to have the opportunity to attend the World Choir Games, but to place as high as they did—in their first competition—is amazing. It is a testament to their passion and dedication." 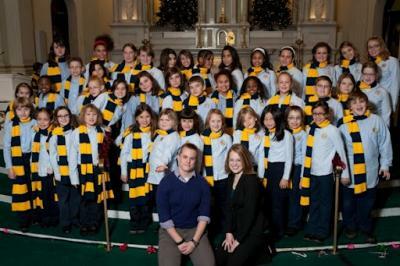 Forty-one choristers, accompanied by YPC staff and chaperones, made the trek to Ohio. The young men and women of the YPC hail from 50 different public and private schools, and the effort is an outreach organization of Penn State Erie, The Behrend College. "Our choristers represented Erie with great pride, excellence, and professionalism this week," said Dr. Jason Bishop, founder and artistic director. "Not only were their musical accomplishments extraordinary, but the personal growth that happened among our singers was profound. Memories were created that will last forever. The Young People's Chorus of Erie is officially now a 'world-class' youth chorus, and I'm extremely proud of the hard work it's taken to get us here." For Bishop, the WCG experience was a great note to end on. At the end of this month, Bishop will leave Erie to join the faculty of Drew University. Dr. Gabrielle Dietrich has been hired as the director of the Penn State Erie, The Behrend College Chorus as well as artistic director of the YPC. Of the YPC, the Concert Chorus won the silver medal and placed ninth in the Youth Choirs of Equal Voices Open Competition. The Young Men's Chorus is bringing home a gold medal and placed second in the Youth Choirs of Equal Voices Open Competition. The Chorale won a gold medal and placed sixth in the Mixed Youth Choirs of Equal Voices Open Competition. For many of these children, this trip and competition is a life-changing event. "The World Choir Games was the best experience in my life and I have grown more this week than I have ever before," said Alexis Turk, 14, PA Cyber Charter School. "I am proud of what all three of our choirs have accomplished at our first international competition." So join the members of the Young People's Chorus at 6 p.m., Monday, July 9 at Penn State Behrend as they celebrate their accomplishments and begin to look forward to the World Choir Games champions' competition in 2014.